While Phillip Island and Wilsons Promontory claim the spotlight as Victoria’s favourite holiday destinations, the coast stretching between these seaside icons waits patiently for the recognition it deserves. This strip of south-eastern seaboard combines beautiful beaches of golden sand, rugged cliffs, striking headlands and tranquil bays. If you haven't already, you should travel Gippsland. Here's why. Driving the Bass Highway past the rolling hills and velvety green pastures of Gippsland, you round a corner just beyond Anderson to be met with dazzling views of the ocean washing the coastline at Kilcunda, 120 kilometres south-east of Melbourne. On rougher days the ocean thunders onto the shore and the wind rips across the clifftops in an exhilarating display of nature. On calm days, the sapphire-coloured ocean sparkles and the waves lap gently as if to apologise. The Bass Coast Rail Trail, which follows the route of the old railway line that once connected Nyora with the historic coal mining town of Wonthaggi, runs through Kilcunda, and includes a wooden trestle bridge across Bourne Creek. 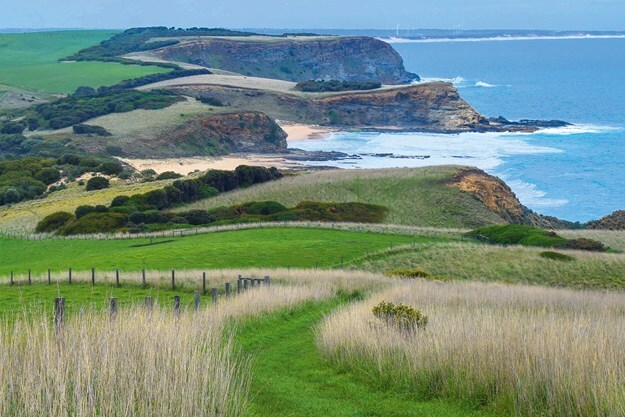 Another scenic highlight is the seven-kilometre-long George Bass Coastal Walk, following the coastline from the end of Punchbowl Road near San Remo to the Kilcunda Foreshore, with panoramic views of Bass Strait along the way. Kilcunda Oceanview: $36 per night for a powered site, $42 for an ocean view site. Harmers Haven is a little known settlement. It's nearly empty: no shops, no traffic lights, and few people. Those fortunate enough to be in the know about this beautiful corner of Bass Coast appreciate that its craggy coastline, pristine beach and profusion of rock pools remains virtually undiscovered. As rock pool rambling or snorkelling goes, it doesn’t get much better than Harmers Haven: colourful seaweeds, sponges, sea stars, feather stars, crabs and marine snails light up the underwater world. Wreck Beach carpark sits a few hundred metres east of Harmers Haven. There, a track winds through tea-tree and banksia to a wooden footbridge crossing the coffee-coloured waters of Coal Creek estuary, where you climb a steep sand dune to the beach. Nine kilometres east of Harmers Haven is the seaside town of Cape Paterson, a favourite destination for generations of holidaymakers enjoying the town’s surf and bay beaches. Cape Paterson Bay Beach is a splendid 400 metre arc of sand tucked behind extensive rock platforms, and is popular for swimming and snorkelling. A large rock pool in the area has long been a popular spot for local kids to learn to swim. Top recommendations: take the Cape Paterson Foreshore Walk through bushland to a number of lookouts along the clifftops; don a snorkel and look for weedy seadragons among kelp gardens at the bay beach; and enjoy a cooling ale at the Cape Paterson Tavern. Cape Paterson Caravan Park: $36 per night for a powered site. 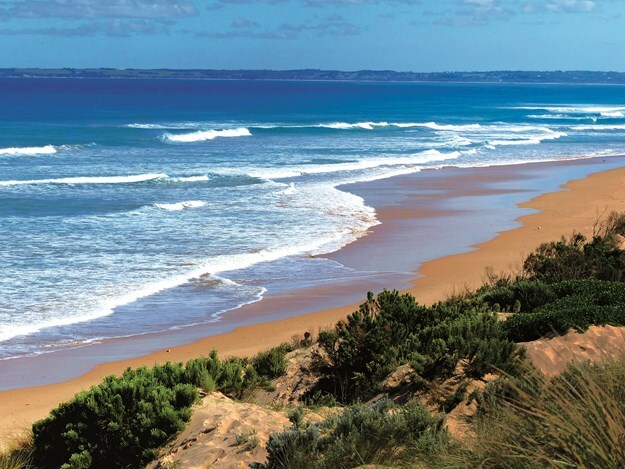 From Cape Paterson it’s 14 kilometres to Inverloch via the Bunurong Coastal Drive, a mini Great Ocean Road that curves along the coastline past striking headlands and sandy coves including Twin Reefs, Shack Bay and Eagles Nest. This stretch boasts a curious history. In 1903, geologist William Hamilton Ferguson discovered Australia’s first dinosaur bone at Eagles Nest. The fossilised bone belonged to a carnivorous theropod thought to be up to 200 million years old. What became known as the ‘Cape Paterson Claw’ lead the way to the discovery of more than 10,000 dinosaur fossils in the area. At the end of the drive comes Inverloch. Situated at the mouth of Andersons Inlet, the town has been a popular holiday destination since the Esplanade Hotel opened in 1896. Nowadays that's helped by the cheery cafes and bakeries, and an additional pub. The inlet’s coastline varies with flood and tidal movements, and the beach at Inverloch is similarly variable. At times, sand has smothered the town’s jetties; at other times they’ve been left high and dry. At low tide, it can feel like you’re setting off across the Sahara Desert from the town’s caravan parks to reach the water. Inverloch Foreshore Camping Reserve: $47 per night for a powered site. Inverloch Big 4 Holiday Park: starting at $56 per night. Extending from Venus Bay to Waratah Bay, the Cape Liptrap Coastal Park covers diverse shorelines from soaring cliffs, to pebble beaches, to long sandy beaches backed by high dunes. Turning off Walkerville South Road, eight kilometres of gravel road leads to Cape Liptrap Lighthouse, a 2.1 metre high light built high above a rocky cliff in 1913. It was Australia’s first automatic Commonwealth funded lighthouse and it still operates today, beaming 18 nautical miles across Bass Strait. From the lighthouse it’s 10 kilometres to secluded Walkerville South, a seaside settlement established in 1875. If you wish to explore Walkerville South, which features a smattering of holiday houses and a lovely beach, you’ll need to unhitch the caravan or camper trailer at the top of a hill before continuing a couple of kilometres down a gravel road to the seashore. In 1875, six lime kilns were constructed beside the stratified cliffs of limestone and greenstone. Between 1878 and 1926, inhabitants mined limestone for the Melbourne building industry. At the peak of production in the 1890s, up to 80 men and their families lived and worked at this remote location. From Walkerville South the 800 metre long Lime Burners Walk links Walkerville’s south and north settlements. It weaves past steep rocky bluffs and the ruins of the lime kilns, and offers panoramic views of Wilsons Promontory in the distance. Walkerville Foreshore Reserve: $40 per night for a powered site. From Walkerville North it’s 18 kilometres north-east to Waratah Bay, an extraordinary stretch of beachfront running some 22 golden kilometres from the western end of the bay to the entrance of Shallow Inlet. Ideal for beach walks, swimming in transparent waters, rock pool rambling, fishing, and generally soaking up the serenity, it’s difficult to beat Waratah Bay. It’s arguably the most spectacular beach on the south-east coast. Nearby, Sandy Point is a community of mostly holiday houses at the start of a narrow peninsula that separates Waratah Bay and Shallow Inlet, at the northern end of Wilsons Promontory National Park. The town is set behind sand dunes, and multiple tracks lead through to the broad surf beach, a popular haunt for surfers and windsurfers, ideal for a leisurely walk at low tide. Sandy Point has a surf lifesaving club, general store and café. Sandy Point Road treks three kilometres to Shallow Inlet, a hidden seaside gem where you can drive your car right onto the beach to launch a boat or a windsurfer, go fishing, or simply take in the incredible views across the bay to the blue-green peaks of Wilsons Promontory. Waratah Bay Caravan Park: $38 per night for a powered site. Bear Gully Campground: from $28.30 per night.